Have you had the chance to join a Border Collie group, yet? If not, you’re truly missing out on some fun times with great people who share a love for the world’s best dog breed! 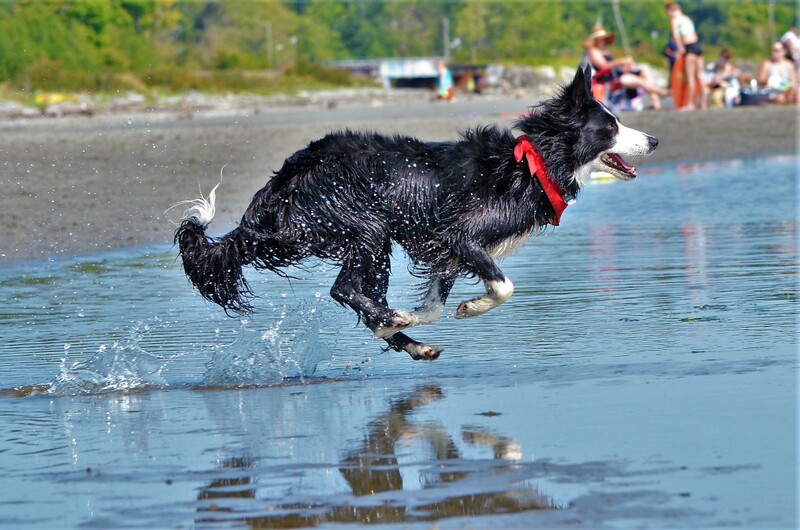 To give you an insight as to what these groups are all about, check out this fun Q&A with Carmen Etchart & Keenan Campbell from Westcoast Border Collies! If you live in the Pacific Northwest and want to join this awesome group, check out their Facebook page for more info! Who founded West Cost Border Collies? When was it founded? We have a Border Collie, named Maya, who is almost 12 years old. Quite frankly, she never ceases to amaze us with her intelligence and engaging personality. Naturally, because of her & her father, Lefty, we have become huge fans of the breed. In late 2015, my husband, Keenan, showed me a picture of over 500 border collies setting a Guinness world record of the most Border Collies photographed together. Instantly, we were hooked on the idea of a local Border Collie gathering, thinking, optimistically, it would be great if we could even hit 20. In April 2016, after several months of deliberation, inspired by various Border Collie fan groups online, we decided to move forward and created a Facebook page, in an effort to try “reaching” those in our community. Thereafter, we picked a date that had high probability of great weather and a low tide, to given us adequate running space. Then, we commenced creating and printing posters. We drove around, distributing them to dog parks, vet clinics, pet supply stores and beach front businesses. We also started sharing our poster on various Facebook pages. What is the group’s purpose or mission? 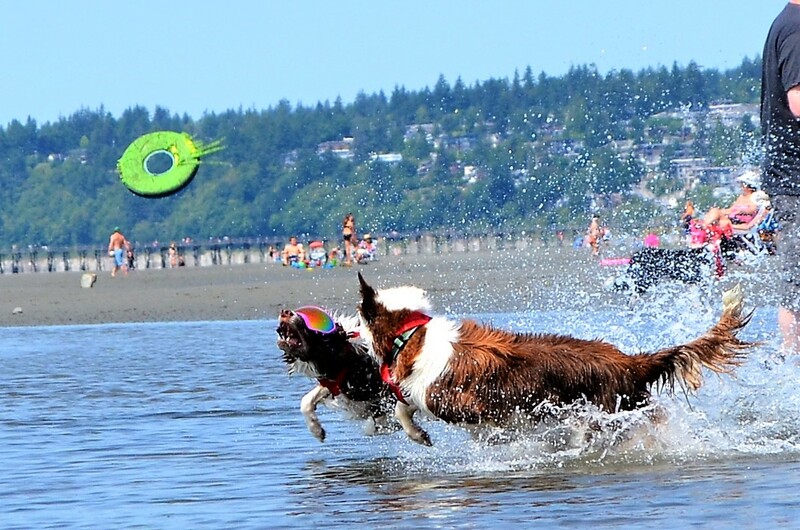 For the first couple of years, our purpose was simply to create a local community of Border Collie fans to share friendship, Border Collie stories & photos, and connect for “play dates”. As we have grown, our interests have expanded to include being a support system for people needing to address health and behavioral issues, helping “lost” pups, providing emotional support for those whose pups have crossed the rainbow bridge, and, importantly, being a platform for Border Collie rescues finding new homes. At our last Jamboree, we have now included raising funds to help local Border Collies in need. How big is the group when it started? How big is now? Initially, our Facebook group consisted of about 10, and has grown to over 1,000 and we estimate that over a third is “local”. We are proud that it is full of so many caring, kind and supportive people! Border Collie people are in a category of their own. With respects to the Jamboree, we started with 47 dogs (approx. 90 people) in year one; year two, we had 91 (approx 170 people), and this past event, we had 119 pups (approx 225 people). This past year, there may have been more but our numbers are based on the bandanas we hand out, as people may not have realized they needed to “check-in” to get their bandana. Each year, we hand make, screen print and distribute free “Westcoast Border Collies” bandanas, to each four-legged attendee. 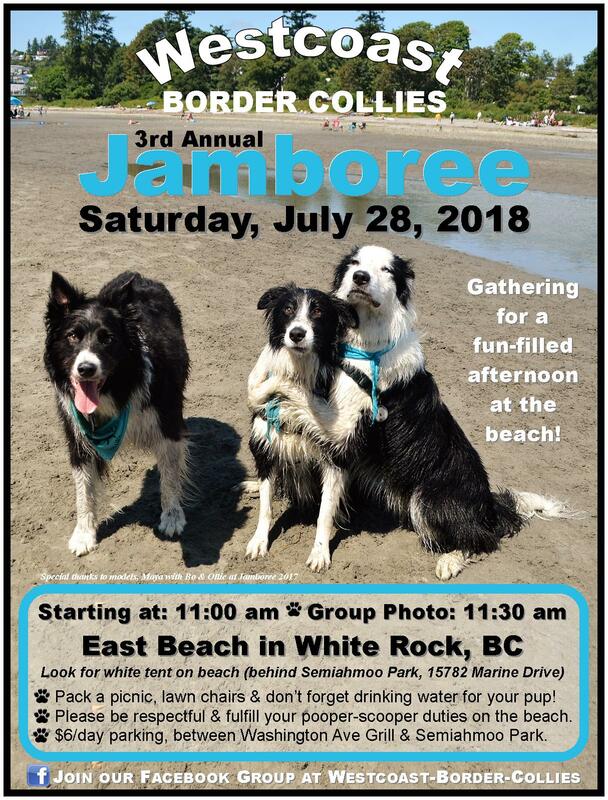 Tell us about the Westcoast Border Collie Jamboree. When did it start? Where is it held? As outlined above, our first Jamboree was in August 2016. 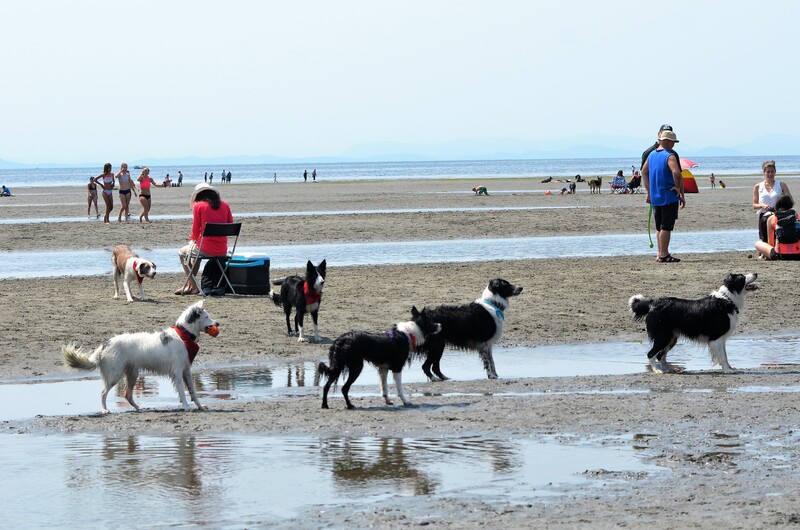 We are so blessed to have a large dog friendly beach called East Beach, and it is located in White Rock, BC Canada. What were your goals with the Jamboree? How many people and their BCs showed up at your first Jamboree? We were hopeful to get 20 dogs for our first Jamboree so when 47 showed up, we were ecstatic. There was approximately 90 people. This event also raises money for charity. Can you tell us a bit more about it? In the first two years, people were so gracious and appreciative of our efforts in hosting these Jamborees, they would offer to make contributions to our expenses. We were doing this as a labour of love so, admittedly, we were uncomfortable accepting money. Over the past 2 1/2 years, we have seen many Border Collie rescues cross our group page and have been thrilled to see some of them get adopted through our members. We greatly admire, and respect people advocating for these beautiful Border Collies and want to, as a group, contribute to these efforts. As such, we felt that the Jamboree would provide a great platform to garner support for this mission, given the kindness and enthusiasm of our attendees. Our 11-year-old nephew, Theo, lives three hours away and was excited to be attending his first Jamboree this year. Learning that we would be having our first fundraiser, he eagerly went on a mission so that he could make a contribution, in Maya’s honour. He sold a homemade BBQ spice rub door to door, in his home town, raising $225. Learning of his efforts, one of our generous members challenged him and committed to doubling his efforts. To encourage donations, aside from free bandanas, we introduced “door prizes”, at our personal expense. We were so pleased that several kind people stepped up and gifted some great “door prizes” as well. The final tally for this year’s donations totaled close to $1400 and we are now in the process of selecting a worthy recipient(s). We look forward to increasing these efforts, with future events, and kind support from our members. What’s it like having over a hundred BCs running around for a day? Is it as amazing and fun as it sounds? It is absolutely as amazing and fun as it sounds! Quite simply, it is a dream to watch all these beautiful, intelligent dogs, gushing with energetic excitement; splashing, diving and chasing balls, Frisbees and each other. Inexplicably, they seem to have this natural, uncanny understanding that they are with their own kind. It is also really special to see the diversity in markings yet the behavioral similarities. Then, you have the human element – people of all ages, from toddler to senior, coming together, simply because of love for their dog and the breed. It is so heartwarming to step back, look around that beautiful beach, and see all these great people just so genuinely happy to be there! It is amazing that some people even travelled 2-4 hours to attend. The post event comments were amazingly positive, and very humbling. It inspires us to continue! 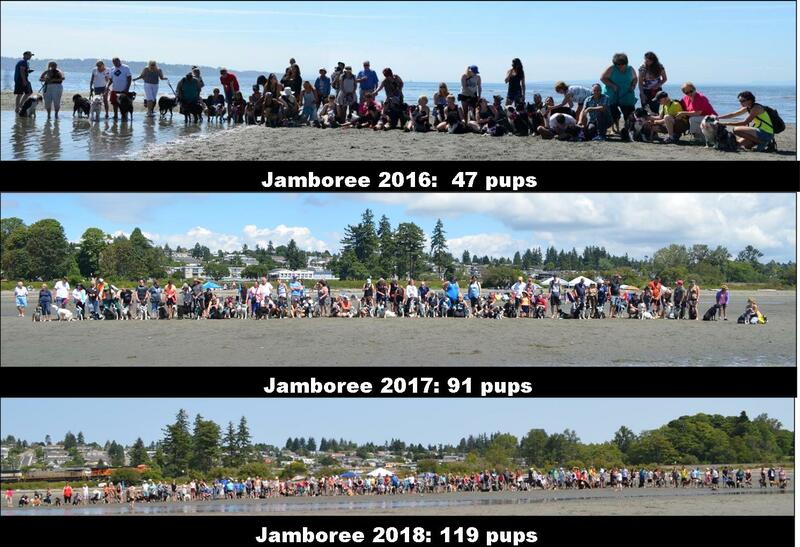 We have attempted to capture the essence of the Jamboree experience by creating highlight videos and posting them on our own Westcoast Border Collies Youtube channel. The videos have been well received but, like anything, you really have to experience it firsthand. 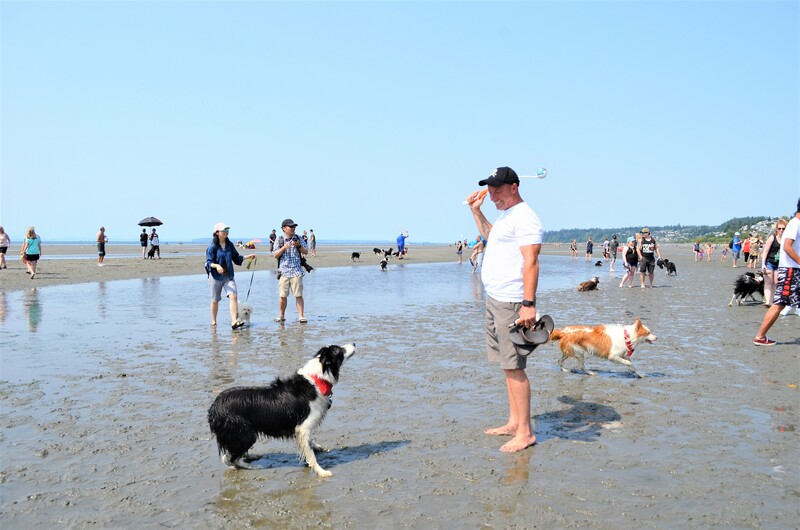 How can people get involved and/or find out more info about attending next year’s Westcoast Border Collies Jamboree? 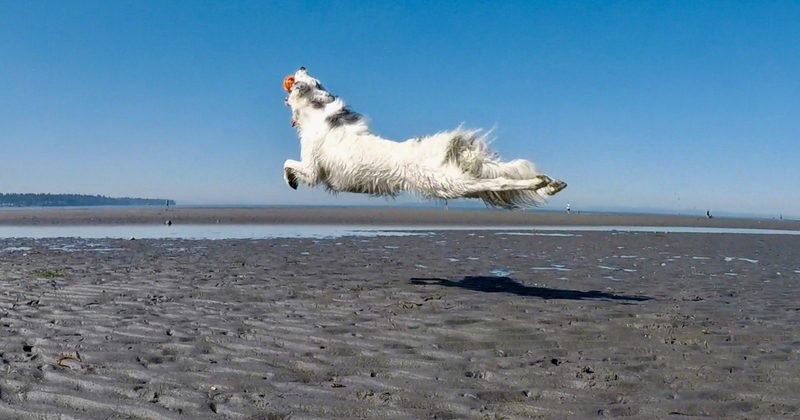 The best way is to simply join our Facebook group, Westcoast-Border–Collies!